My kids love this colorful, slightly sweet and tangy chutney. 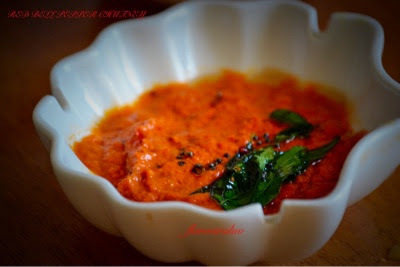 Red capsicum adds a nice sweetness to this chutney. It is very easy to make. 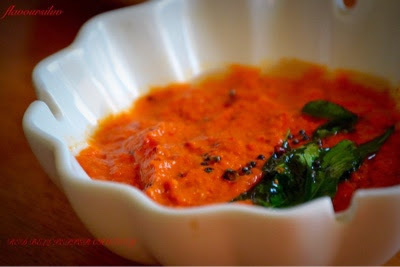 If you are looking for a simple chutney without coconut, then this recipe is for you. In a pan heat oil and add urad dal and red chilly, when dal turns golden brown, add roughly chopped onion and saute till onion turns pink in color. 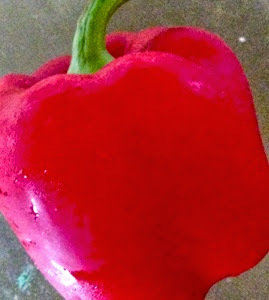 Now add roughly chopped capsicum and saute in a medium flame. Switch off the flame and add tamarind and salt. Allow this to cool. In a small pan, heat oil and add mustard seeds. When it splutter, add curry leaves and pour this into the red chutney. Serve with dosa or idly. This also tastes good with biriyani or ghee rice too.